Gumbo is one dish I have never tried to make myself. Definitely need to add this one to the list! I’ve been meaning to try this gumbo for a long time now. Looks so good. I finally have shrimp in the fridge. so this has got to get done soon. Sounds so easy and perfect for the season. So many big flavors in this recipe that is has got to be absolutely delicious! I’ve never made a gumbo before, but my fiance would love this one! Will have to try it soon! Wow, I have never tried this dishes, but now I need to try it immediately! I want to eat it for breakfast lunch and dinner. It looks very tasty. Oh, I love shrimp. This dish looks very tasty. I like how you combined all the ingredients. It is really interesting. Thanks! My family and I love gumbo! Your recipe is delicious and easy to follow! I love that you are not using file, it is hard to find and I love the spices you have chosen. This is the epitome of comfort food for me! 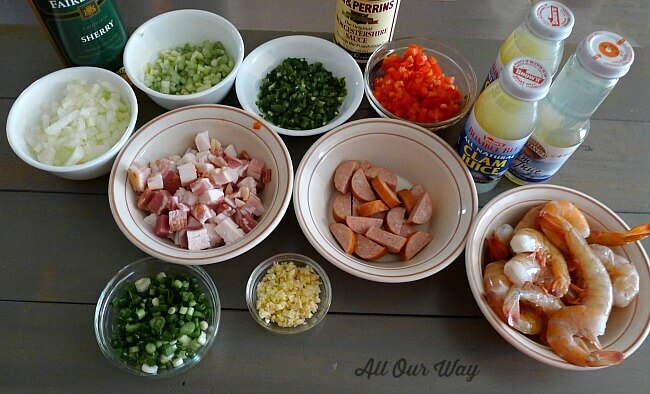 I have never made a gumbo.. you sure are amazing with your array and talents of all cuisines. We are pretty boring here eating the same Italian or Mexican cuisines. I dont eat any meat so its hard for me other than greens and beans to eat. Everyone else I think will really love it if I made something like this. Sounds wonderful ! Its the only way for me to stay off medications no meats lol boy I wish I could be 24 again! I have never made gumbo. In fact, I don’t think I have ever tried gumbo! It sure looks delicious though! You’ll have to try Cathleen. It is really excellent. So delicious! Oh my goodness, my family would go crazy for this dish. I’ll have to add it to our next meal plan. There’s so much good flavors going on i this stew. I love it. It’s so summery and super delicious. I love the shrimp + sausage combo. I know my hubby will like it since it has sausages in it 🙂 Saving this to try. Lovely recipe Marisa. Lemme at this gumbo! The last time I had a gumbo was when I was down South! 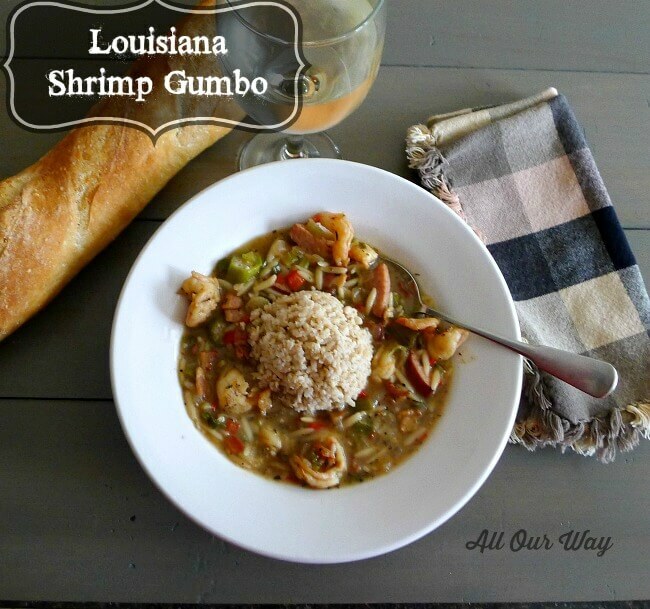 I’ll have to give this recipe a try because I am craving a gumbo dinner. It’s been years since I’ve had gumbo and this one looks so tasty, love the mound of rice in the middle. I’ll have to give this recipe a try for my family. Look at all the goodness in that gumbo! We love gumbo on those damp, cool fall days when the chill is into your bones. My husband loves it and I don’t usually have much left over! I know what you mean, Noel. One of our youngsters can’t eat shrimp so we’ve made it with chicken. It’s still good but the shrimp adds more pizzazz. Wow Marisa, this looks delicious! I actually happen to have file in my pantry that my sister-in-law brought me and haven’t used it yet. I’m definitely going to make your recipe for the gumbo and maybe add a little of that. But I love how your recipe calls for ingredients that everyone can get. Great post, yum! Thank you, Sally. Throughout the years we’ve made this recipe a lot. In fact, we’ve even used chicken but we think the shrimp keeps to the seafood taste. I love gumbo and have only eaten it in the US on my trips which 10 years ago were often. I have never been to Louisiana but heard great things about it. I’m going to save this for later when i’m in the mood for some comfort food. Hi, Veena! I think you’ll really like it. You control the heat of the gumbo. Honestly, because I live in Australia I have never had gumbo before, but I always hear wonderful things about. And I noticed how many ingredients were in yours, so I am sure it tastes incredible. Thank you for sharing! We do love our Gumbo, Nicolas. I do think you’d be able to find the ingredients in Australia. You have to make it — you’ll love it too. This gumbo sounds so lovely. Okra is a bit hard to get around here and I’m not too keen on it either, but I would definitely want to try it in this dish. Hi, Nicole! When we can’t find fresh okra we use the frozen variety. I don’t think it’s got a distinct flavor within the Gumbo. You can leave it out but Gumbo helps to thicken the liquid. I know someone that lives in Louisiana and she is all about gumbo. Yours sounds quite flavorful and like it would really warm the belly. Hi, Valerie! It certainly does warm a body up. If your friend makes Gumbo, perhaps you can compare recipes. Hi, Trupti! Yes, okra is popular, how much in Louisiana I’m not sure but it is used quite a bit in the south. We hope you try this out. 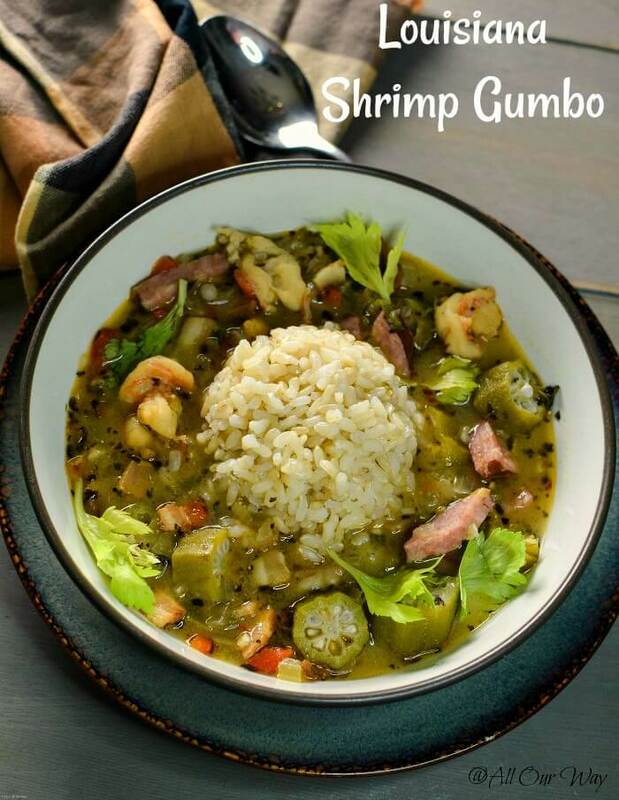 Delicious, yes gumbo is classic dish of Louisina’s cuisine with it unique blend of spices and flavors . 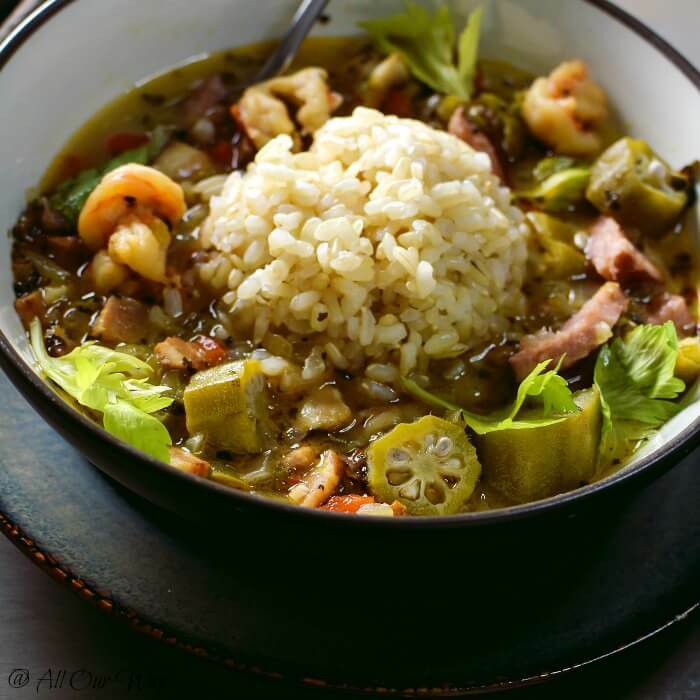 I love the way your put classic shrimp and okra gumbo. I need to to try. Thank you, Swathi! I hope you do try the gumbo — it is delicious. I’m blown away by all the flavors in your recipe, I need to find file powder or make my own so I can truly experience the authentic taste. Thank you for your recipe. You’re welcome, Michelle. Let me know how you like the gumbo. Living in the south now, we grow tons of okra as we use it a lot in our Indian recipes. I love your gumbo recipe and I will give it a try making it vegetarian. That sounds like a great recipe to make for the weekend lunch! Hi, Sandhya! Let me know how it turns out as a vegetarian dish. Have a wonderful day. It has been ages since I’ve had gumbo and this looks marvelous! Now I’m craving gumbo. 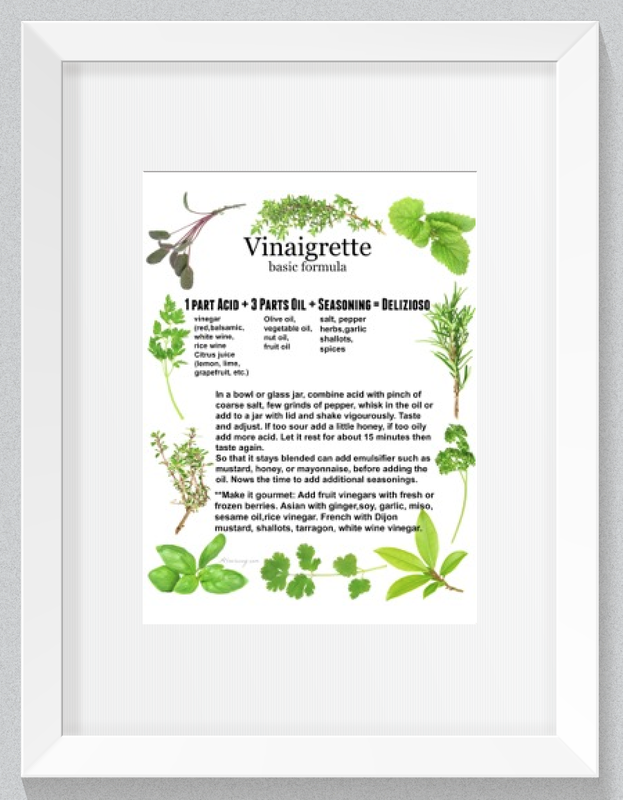 With it being still so chilly here in NY I might have to make a pot this week…I know the family will love it! Hi, Catherine. I think we are skipping over spring and we’ll go directly into summer. It’s cold here too. 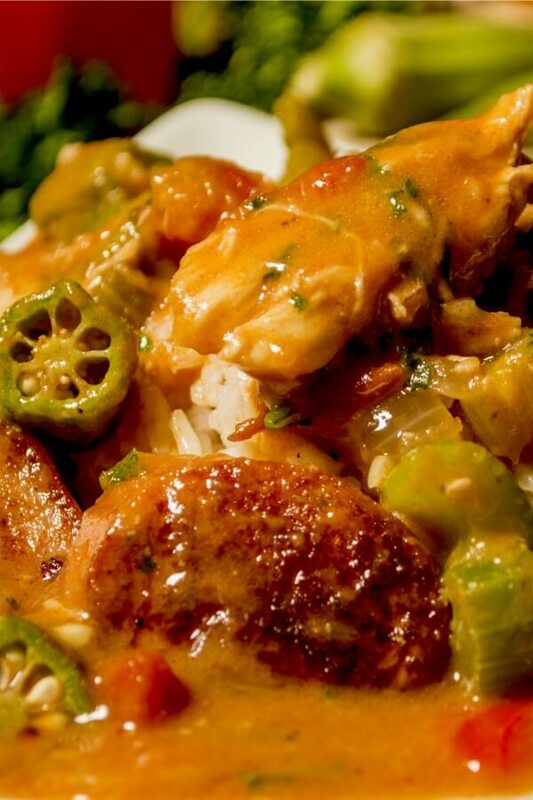 The gumbo will definitely warm you and your family up. This is right up my husband’s alley! I am so getting all of these ingredients to make this ASAP! Thank you for sharing this! Hi Marisa, Your gumbo recipe sounds so delicious! I like that the proportions seem just right for a nice big pot for the family (with maybe a little left over.) Allot of gumbo recipes I looked at seem so enormous. I thought I’d be eating gumbo forever. This is just right. Thank you, Michelle! Yes, it does make a perfect amount. I like enough left over for one more meal! I’m sure you and your family will enjoy it. 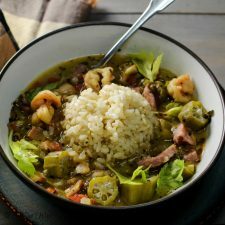 This gumbo is new for me and looks outrageously delicious I know my husband is going to love everything about it so its a must try soon. I need to get out and buy the ingredients. Thanks for opening up a new meal for us! Ciao, Claudia! We introduced this meal to my mamma and papà and they loved it. Some of the ingredients were a bit different for them but they were nuts about the taste. That looks so flavorful and delicious! With this cold snap we’ve been having, this looks like the perfect dinner to warm us back up! Hi, Carlee! I know what you mean about the cold. We’re in Indiana and last year at this time I had beautiful flowers blooming. The gumbo will warm you up. Ciao, Kathryn! I do hope you give the gumbo a try. I think I’ve only ever had gumbo once, at a restaurant, and it was so good. I never thought we could recreate it at home…now we can! This looks so delicious. And perfect for chilly days. First of all your photos look wonderful! I wish I had a big bowl of this in front of me right now. I have to try this recipe for my husband. It’s his favorite and I never make it for him. Thank you, Denise! I wish I could send you a bowl. I only heard of Louisiana and it wonderful food. This sounds so delicious. I love shrimp and I love such comfort food in a bowl at this time of the year. Cannot wait to try this.. Looks so delish. I hope to go there too, Veena! Let me know how you and your family like the gumbo. I really need to visit New Orleans….just for food like this. For some reason I do not like okra, but maybe I could change that. This sounds perfect for the comfort food season…especially with the addition of the jalapenos!! I’ve never been to New Orleans but I hear it is quite an experience. The food alone would be worth the trip. I LOVE gumbo! I can’t wait to try this recipe! Thanks for sharing. You’re welcome, Elaine! The recipe is oh so easy and tasty!! I’m sure you’ll enjoy it. 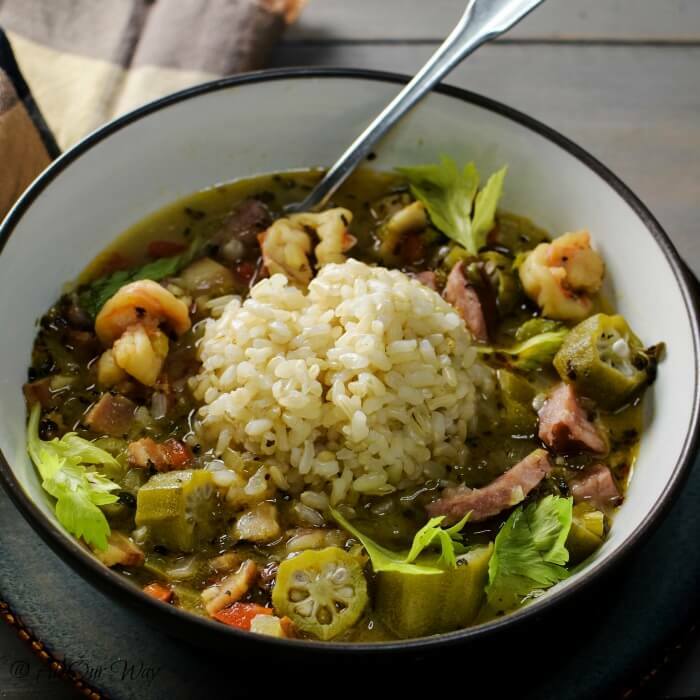 Your version of gumbo looks scrumptious! Hi Dorothy! It is good — we had a neighborhood pot luck type of dinner. The gumbo was gone before half of the neighbors had a chance to sample. You see, the ones that tasted it to begin with went back for seconds. I was fortunate enough to visit New Orleans for work several years ago. I forgot how good gumbo was (I think I tried it ever where we ate). I will be putting this on the meal plan list for next week, because this recipe looks amazing! Hi Melissa! Making gumbo will be a nice reminder of a great time. You’ll love making it at home. What an awesome rendition of timeless classic. Believe it or not, I’ve never made gumbo but I certainly love to enjoy it; thanks for the inspiration! Never made gumbo??? Oh my! It isn’t difficult and the reward for making it is incredibly tasty. It really started as a leftover for whatever you had — isn’t that how many incredible recipes start? Let us know if you do make it. This looks incredible! I love all the history and information you gave about the origin of gumbo too – stuff I would have never known! Thanks for sharing! We actually do a peanut butter colored roux for our chicken/andouille gumbo and my husband does a chocolate colored one for his seafood gumbo. He adds tomatoes to his so his is more of a creole vs cajun gumbo – no one ever seems to care. (He’s from a tiny bayou town in Louisiana, I’m from a river town outside of New Orleans. The little differences are interesting.) This soup is what you make it! And looks like you made a tasty one! (Some of us also put our “smashed” potato salad directly in the bowl with the gumbo.) Had to fedx my daughter a king cake this year. She just moved to California and is missing Louisiana like crazy. Now I’m off to wander around your lovely blog! Every time we’ve made it there wasn’t even a morsel left!! Buon Appetito! Those versions sound wonderful!! Wish we could have a big gumbo cook-off and taste away!! I think I’ve had Gumbo a couple of times in local restaurants here, but not sure how authentic they were. Your recipe sounds nice and exotic. 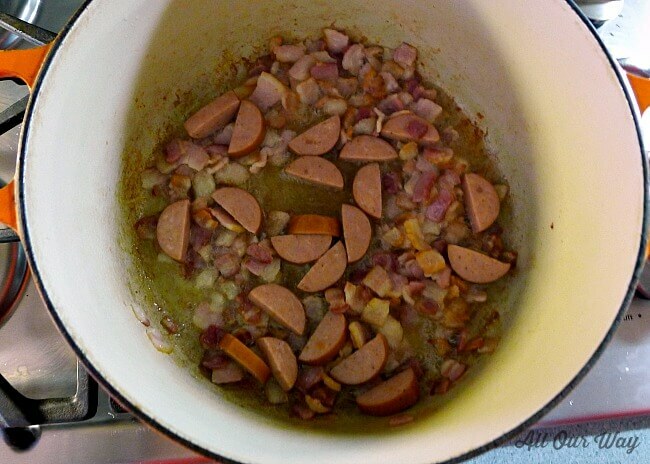 We went to a Mardi Gras party several years ago and we made this gumbo. There were several Louisiana natives that attended the party and they raved about the gumbo. Let me know if you make it and how you like it. If you don’t want to add the jalapenos, you can add 1 teaspoon cayenne instead. Hi Marisa, I always wanted to go to Louisiana, so to content myself for now I would love to give your gumbo a try. Thanks looks so delicious. There is nothing like fresh caught shrimp from the Gulf. Your delicious looking recipe would certaily highlight the quality of the shrimp.Very authentic. Laissez les bons temps rouler! You are so right about fresh Gulf shrimp! They are excellent! Mmmmm! This sounds wonderful! Can’t wait to try this recipe! Thanks for a wonderful post! This is a little different than an Italian recipe but we like the flavors!